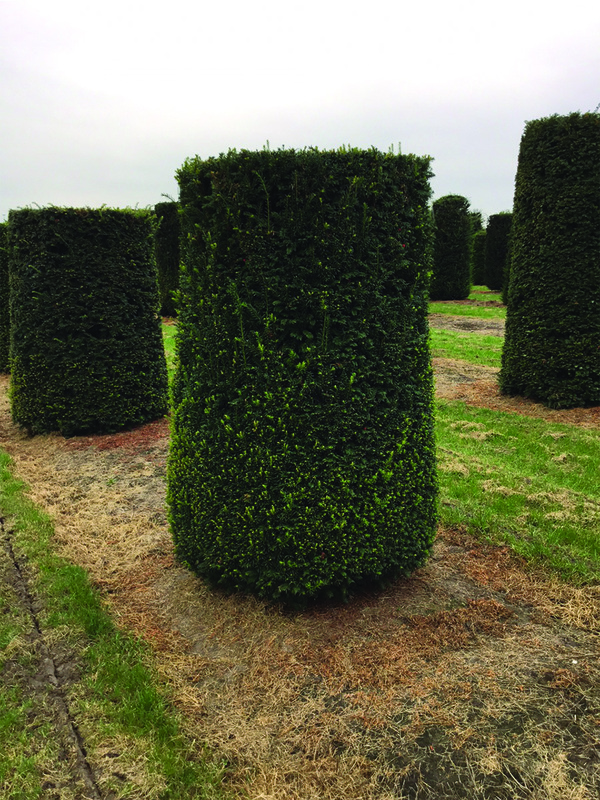 At 2.2 Metres this Yew is more formal option with unusual shapes and structures readily available to create an instant impact. Yew is slow growing and only requires pruning once a year. Their slow growth does mean that these large specimens take many years to reach maturity but have been seen in English gardens for centuries. The yew is a long-living native British evergreen which is broadly conical in shape. It's spreading, horizontal branches, scaly, purple-brown bark with linear, glossy or matt dark green leaves help make an excellent formal hedge or tree line when fully grown. Flowers are visible in March and April. Male flowers are small white-yellow globe-like structures and contrast with the female equivalent which are bud-like and change from green to brown with age. The Royal Horticultural Society has given the yew its prestigious Award of Garden Merit (AGM). Yew trees can reach 600 years of age and are often associated with churches. Yews were seen as symbols of immortality and it has been custom for yew branches to be carried on Palm Sunday. It is thought that they were also planted on the graves of plague victims to protect and purify the dead. It is a very low maintenance tree and can be planted in a variety of different soils as long as the drainage is good; it will not tolerate water logging. The yew will also enjoy both sun and shady conditions as well as having the ability to withstand hard clippings twice a year (Spring and Summer). If overgrown, don’t be afraid to cut them back to the stumps. Specifically grown for use in hedging and topiary, the yew also makes great ground cover; even in dense, dry shade. They even tolerate exposure to urban pollution.